After 18 straight conference wins, finally a loss for N.C. Central. DURHAM, N.C. – Juwan Carter threw four TD passes, including a pair of long scoring plays to Marcus Taylor, and the Norfolk State defense came up with two late interceptions that helped clinch the Spartans’ 28-21 win over defending MEAC champion and No. 25 ranked North Carolina Central on Saturday afternoon at O’Kelly-Riddick Stadium. Carter’s three first-half TD passes staked NSU (3-4, 3-1 MEAC) to a 21-0 halftime lead and his 58-yard TD pass to Taylor in the fourth helped slow NCCU’s comeback attempt. Then senior linebackers Kyle Archie and Anthony Smith intercepted passes in the final three minutes as the Spartans snapped NCCU’s 18-game MEAC winning streak and 11-game home winning streak. Smith was a force on defense for NSU, which defeated a ranked FCS team for the first time since topping No. 10/12 Bethune-Cookman in 2013. Smith amassed a career-high-tying 18 tackles and two interceptions, and he also forced a fumble in the first half as NCCU (5-2, 3-1) appeared headed for a sure touchdown. 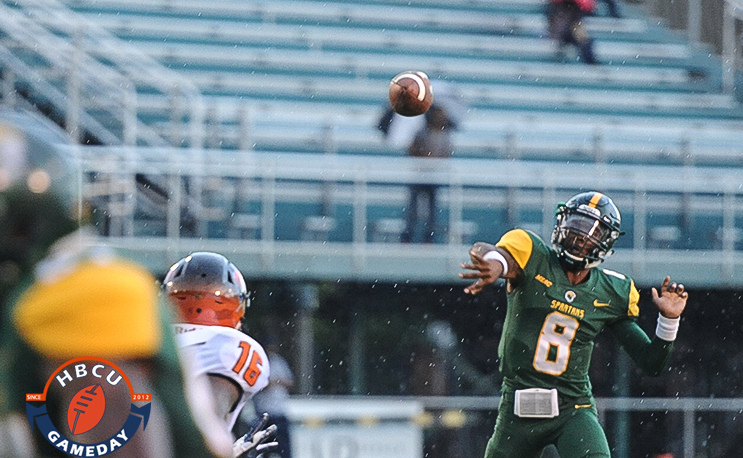 Carter got NSU on the board with 9:01 left in the first quarter with a 3-yard TD pass to freshman running back C.J. Jones on a fourth-down play, which put the Spartans ahead 7-0. Smith came up with the first of his many big plays on the following drive. And second-and-goal at the NSU 6, Eagle quarterback Chauncey Caldwell darted up the middle and was a yard away from reaching the end zone when Smith forced him to fumble at the goal line. NSU defensive tackle Deshaywn Middleton recovered the fumble in the end zone for a touchback. Smith’s first interception of the day and subsequent 22-yard return set up NSU’s next touchdown, an 11-yard TD strike to freshman Isaiah Winstead with 7:19 left in the half. After forcing NCCU into a three-and-out, Taylor turned a short swing pass from Carter into a 42-yard TD play to extend the Spartans’ advantage to 21-0 and stun the home crowd. NCCU rallied in the second half behind backup quarterback Naiil Ramadan. He ran for an 8-yard touchdown in the third quarter, and his 23-yard TD pass to Josh McCoy with 12:24 left in the game brought the Eagles within 21-14. NSU had a quick answer. On third-and-8, Carter threaded a completion to Taylor, who then outraced a defender en route to a 58-yard TD play to double NSU’s edge to 28-14. But with more than eight minutes left, the Eagles kept coming. Ramadan capped a quick seven-play drive with a 4-yard TD pass to McCoy to again cut the Spartans’ lead to seven points. After forcing NSU to punt, the Eagles drove deep into NSU territory. But on a third-and-15 play, Archie deflected a screen pass by Ramadan and wrestled it away from intended receiver Ramone Simpson for a key interception with 1:48 remaining. The Spartans ran the ball three times to milk the clock and force NCCU to use its two remaining timeouts. The Eagles got the ball back at their 37 with 42 seconds left. But six plays later, Smith intercepted Ramadan at the NSU 35-yard line to finish off NSU’s first win over the Eagles since 1995. NCCU had won the previous four meetings between the teams in their respective Division I tenures, all by 11 points or less. Carter completed 18 of 32 passes for 230 yards and the career-high four TD passes. One week after finishing with a career-best 111 receiving yards against Hampton, Taylor more than doubled that output against NCCU. The junior snared eight passes for a new career-high 132 yards and two more scores. Saturday marked the second time in three games Smith finished with exactly 18 tackles. He also achieved the feat against Florida A&M on Oct. 7. Archie and defensive end Nigel Chavis both recorded 10 tackles, while Onaje Bullen had a career-high nine and two pass breakups. Freshman cornerback Rashard Russell Jr. was credited with four of NSU’s season-high nine pass deflections. Ramadan finished 21-of-35 for 236 yards and three total touchdowns (two passing). The Spartans are home for their next two games, starting with a 2 p.m. contest with Savannah State next Saturday for NSU’s homecoming. NCCU returns home on Oct. 28 to host Delaware State for homecoming. Kickoff is set for 2 p.m.